As we’ve always said, while you get what you pay for, the best products are not necessarily the fanciest ones. This applies to residential water filters also: if you spend a bit of time researching, you will see that you can get very effective filters for the exact purpose you require without bleeding your wallet dry. 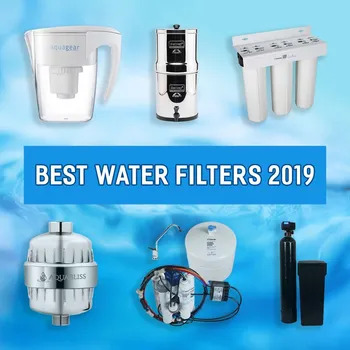 That’s exactly what this article is about: helping you pick the best water filters and filtration systems for any intended purpose. Before getting a household filtration device, it’s important to determine what the filter should remove by getting your water tested. How Do You Know If The Water is Clean Enough? If you are using communal water, there should be a report of the water quality in your state/town available on the website of the United States Environmental Protection Agency (EPA). If you are using water from a private well, or water whose quality you are not so sure of, there are several ways to test if it’s safe. The easiest, quickest, and most affordable way is to check the water with your own senses. For example, if you see clouds or particles in the water, it’s probably not safe to drink it or even shower with it. Similarly, an unusual taste or odor may suggest a high level of contaminants such as chloramine, iron, or sulfur, or one or more dangerous chemicals. Another popular method is to look for a home water quality test kit. These kits are very easily available online or at local shops. They typically contain strips that change colors when exposed to the contaminants in your water. They can give you an idea of whether or not, and sometimes how badly, your water is contaminated of some certain substances. Unfortunately, the aforementioned methods are not terribly reliable. They do not identify a very wide variety of substances, and of the few contaminants that can be detected, the exact levels of pollution are usually not clear. The most efficient way, we believe, is to contact a state-certified lab in your area and send your water there for an examination. Here’s a list of labs recommended by the EPA for every state or territory in the US. You can also do the testing at one of the labs approved by the EPA to meet the proficiency testing criteria for the fourth Unregulated Contaminant Monitoring Rule (UCMR). Once you’ve determined the level of contamination your water is in, you can now decide how clean you want it, and which kind of filters to choose for specific purposes. Given that there will also be differences not only in method of filtration and capability, but also in size, point and manner of installation among the filters, it can sometimes be difficult to pick out the exact one you’re looking for. That’s why we thought some recommendation and review could be helpful. It’s beyond dispute that only the cleanest water, the type with safe levels of chemicals, microorganisms, and other contaminants, should be used for drinking. You want your filter to bring your drinking water to those levels. While the daily fluid intake recommendations vary among individuals, a common and reasonable goal is for an average adult to drink about half a gallon of water every day, plus some water from foods. Thus, you don’t usually need a huge filtration system for drinking water. A simple everyday water pitcher or a countertop filter will, most of the time, suffice. At almost triple the price of any of the Brita or Pur filters of the same size, the Aquagear is still surpassing the big names to become the new star in the world of water pitcher filters. It isn’t NSF certified, but the US-made 5-stage filter is certified by an independent lab to meet and surpass NSF standard 42 for improvement of water taste and smell. It also meets standard 53 for lead removal, which is rare among filter pitchers. As small as it may look, the cartridge filters water to reduce 90 to 99% of fluoride, chloramine, mercury, and a plethora of other contaminants. The secret? The numerous 2-micron pores in the filtration materials, which trap the pollutants as water passes through it. The water filter pitcher can hold 8 cups, or half a gallon, of water at a time – the recommended amount for one person to drink per day. Doesn’t matter if you’re a large family: refilling is fast and easy, as the pitcher has a lid with a pressure valve on the top. The whole item is made with BPA-free, DPA-approved food grade materials, and is 100% recyclable. Its 5-stage filter can handle 150 gallons of tap water in its lifetime. It’s a turtle of the category, lasting for a good half year, while others typically can only survive for 2 to 3 months before a replacement is required. One thing to note: While this pitcher filter is very effective for tap water, it doesn’t have the capacity to handle well water. Well water, which comes with algae, microorganisms, and heavy metals, requires larger and stronger filters, which we will also cover later in this article. Taking about 1.5 minutes for every cup of filtered water, the 8-cup Aquagear is the perfect pitcher for a household of three or smaller, who wish to stay hydrated with fresh water on budget without the fuss of installation/too much pain on the budget. This Big Berkey beast comes with fluoride and arsenic filters, and the famous Black Berkey purification elements that are certified by State and EPA accredited laboratories to surpass NSF International Standard 53. These elements can remove more than 99.99% of pathogenic bacteria such as E.coli, and are claimed to mechanically remove red food color, which is unique for a filter of its type. Pure water, that’s what it promises. With effectiveness being a priority, the Big Berkey takes its time to process the water. It generally takes one to two hours to finish a batch of 2.25 gallons – that’s about 3 minutes for every cup of filtered water. So basically, it’s an Internet Explorer when it comes to speed. Yet, you can’t complaint for the quality of water it produces. Check that it’s refilled at night, and you’ll be good to go. Replacing the filters on this system is slightly trickier compared to simple filters, with which you normally just have to throw a whole cartridge away and lock a new one in. Each of the filtration elements has a different life span, so you will have to take notes and keep a careful track of when you should replace which component. Don’t worry too much, though. Filter replacements are very easily available on Amazon. Plus, the ones that need changing most often are the Berkey PF-2 Elements, and they can handle 1000 gallons of water before retirement. Given the generous chamber size (2.25 gal), this Berkey can keep a household of up 6 people well hydrated with one refill per day, so those elements may last a good one year. Bonus: The Berkey comes in a 304 stainless steel body, and the package also includes a stainless steel 24-oz bottle so you can ditch the cheap plastic bottles for good. As a family, you will need a little more water than the recommended daily intake if you’re also using the water for cooking. Per our observation, a person would need double the amount, or almost 1 gallon of water for drinking and cooking. While a water filter pitcher or countertop filter would still be sufficient, the constant re-filling can be frustrating. In this case, a water filter of slightly larger capacity is required. Reverse osmosis filters are some of the strongest, most effective filters for drinking water. They are known to remove more than 99% of most dangerous contaminants in the water, including heavy metals, herbicides, pesticides, chlorine and other chemicals, and even hormones. The Home Master Artesian undersink RO system sure does an excellent job when it comes to removing contaminants and purifying water. Coming with a complete set of pre-filters, reverse osmosis membrane, and post-filter, the Home Master Artesian reverse osmosis filter system offers 7 stages of water purification and enhancement. Healthy minerals are added twice along the purification process to make up for the loss caused by the super strong membrane, effectively protecting the tank and increasing water alkalinity. Another feature that makes the Home Master system a far cry from others is its ability to minimize water waste with a permeate pump. The waste water: pure water ratio can reach 1:1, which is extremely low compared to conventional RO systems, where the ratio is typically closer to 4:1 or 5:1. The pump is also the key factor in boosting the speed performance of this system: given the right conditions, it can produce an impressive amount of 75 gallons of purified water per day, or one cup per minute. It has a 3.2-gallon-storage-tank, which can be handy for when you need a large amount at once. Given the high speed of water processing, it can comfortably accommodate a family of 3 to 6 people. The installation of this RO filter can be a bit trickier than the tap-mount or countertop filter, as it requires some drilling and wrenching. On the other hand, maintenance is a walk in the park – the modular filters take only a couple of minutes to change, and only require replacement once a year. While being able to produce enough pure drinking water for 6 people, however, the filter may not be enough if you also need the water for cooking. It can only accommodate 3 people or less. A larger household should consider the Home Master undersink RO system for better convenience. Using tap water and hating the smell? This Culligan FM-15A filter might be one of the quickest and most effective solutions to your predicament. Built small, compact, and simple so that it can be attached to the head of your faucet, the Culligan FM-15A is a mighty filter. It’s certified by the NSF for removing chlorine as well as any foul taste and odor in tap water – the water that passes through this device will also pass any taste test. This filter can also remove lead, rust, dirt, sand, and sediment particles as small as 0.5 micron. To give you an idea, a human red blood cell is about 5 – 8 micron in size. What people love about the little filter is that it takes next to no time to produce fresh water. Some reduction in pressure might be experienced, but usually, you can get one cup of filtered water in less than 30 seconds. Installation is also a piece of cake: a total noob can figure it out and get it fastened onto the faucet within 5 minutes. That’s also why the thing is sometimes made into an inter-city travel companion when a water snob wants to make sure they get quality water everywhere they go. The major weakness of the Culligan, as well as most tap-mount filters, lies in the small size – it can’t handle more than 200 gallons in its life time. This would require bi-monthly replacement of the filter for a household of 2 – 3 people. More than 3 people, and the maintenance would be a bit overwhelming. To prolong the filter life, you can switch it off when doing normal washing and cleaning tasks which don’t require filtered water. However, the fact that the device is installed on the faucet means it more often than not will also be employed for other purposes. Plus, the constant switching makes it more prone to leakage, causing unfiltered water to mix with and contaminate filtered water. This is unfortunately a common problem on tap-mount filters. Water from private wells is typically more prone to dangerous pathogens, as it’s not processed with chemicals such as chlorine, chloramine, or fluoride before travelling to the tap. Depending on the geological characteristics of the area, metals such as iron, lead, mercury, copper, nickel, or chromium may be present, potentially causing health issues if consumed. These metals, together with minerals such as calcium and magnesium, can result in limescale and damage to your pipe system and water appliances. On top of that, they also cause the symbolic metallic taste in the water. For safe consumption of well water, the following filtration systems are recommended. If you’re using well water, you need something to come BEFORE a softener, shower filter, or drinking water filter. It should remove the large sediments, algae, and part of the heavy metals and minerals, and bring the water to a basic level of cleanness, before any further treatments are applied. For that purpose, we recommend this excellent water filter system from the NSF listed brand Home Master. The Home Master HMF3SDGFEC is designed specifically to treat well water. It comes with 3 cartridges, representing 3 stages of filtration. In the first stage, a multi gradient density filter removes up to 95 percent of iron, manganese, sediment, chemicals and other contaminants in the water, down to the size of 1 micron. Next, the special filter reduces iron of up to 3 ppm. This is to make sure there will be as little of the annoying metal as possible to irritate your skin and cause damages on the in-house pipe system and water appliances. Finally, the granular activated coconut shell carbon filter gives the water a final polish, removing chemicals and any unpleasant taste or odor in it. Best of all, this is done without significant reduction of the water pressure in your home, thanks to the large capacity of the cartridges (100,000 gallon). The filter can last a full year for a family of four, and no maintenance is required until it requires replacement. Note that while this system is very effective in filtering water, it does not take care of all the microorganisms and chemicals found in the water. It is sufficient in making the water clean and safe enough for showering, given that the well is not dangerously contaminated. For drinking water, however, you will need to install an extra RO undersink filter or a strong countertop filtration system. Upgrade the Home Master Artesian, and you have the Home Master TMHP HydroPerfection reverse osmosis filter system. Apart from the super effective pre and post carbon filters, and reverse osmosis membrane, which also exist on the other Home Master under-sink RO versions, the HydroPerfection comes with iron filtration materials, which is a must for any well water filter. As earlier explained, water from private wells is typically more prone to dangerous pathogens, as it’s not processed with chemicals such as chlorine, chloramine, or fluoride before travelling to the tap. The HydroPerfection solves the problem with a UV chamber that can destroy 99.99% of any microorganisms (germs, bacteria and viruses – such as E. coli,) that make it past the RO membrane. The water you get after this stage is the closest thing to distilled water in terms of quality. Remineralization is still a feature on this system, with a small amount of calcium and magnesium added into the water at two points: before the water travels to the tank to prevent tank degradation, and before it comes to the faucet to improve taste. You will find the filtered water tasting a lot fresher and “sweeter” than the typical acidic RO water. Similar to the Artesian, the HydroPerfection RO filter system has a permeate pump that helps reduce water wastage by 80%. The canister filter design is retained, with the filters incorporated into their housings for improved hygiene and ease of replacement. Hating the dryness on your skin and hair after a shower, and tired of cleaning the yellowish stain that constantly appears at the water level in your bathtub? Scratch your head no more, because you are only a water filter/softener away from getting the problem solved. The Pentair 5600sxt-48k-10 is an NSF certified salt-based water softening system with a high capacity (48,000 grain). It uses an ion exchange to remove calcium and magnesium, the culprits of water hardness in your water, effectively softening it. Effective in softening water and resolving hard water problems. Reduces skin and hair irritation. In fact, the softener can not only save your hair and skin from dryness and irritation, but it can also protect your pipe system as well as water appliances from damage caused by limescale, which results from water hardness. Since it removes sticky hard minerals, it will keep your tiles and all sorts of surfaces that you clean with the water shiny and free of the annoying white film usually seen in households with hard water. What’s cool about this softener is that it has a flow meter which measures your actual water use, and allows the system to regenerate as needed. That’s for saving both salt and water, but it also can regenerate on a pre-set time schedule like most other systems if that’s what you prefer. For enhanced durability in chemical-treated communal water, the softener has a commercial-standard 10% crosslink resin. While it doesn’t soften water to the extent a whole softening system does, the AquaBliss is still an excellent (and easy!) solution to brittle and falling hair and skin irritation caused by communal water. This little showerhead filter offers 12 stages of water treatment. With sediment filters, the super powerful KDF 55, calcium sulfite, activated carbon and super porous ceramic balls, it reduces, chlorine, heavy metals (lead, mercury, nickel, chromium), various dissolved solids, bacteria, pesticides, and inhibits the growth of fungi, making the water safe for showering. It also goes a step further by providing vitamin C and other materials that boost negative ions and oxygen levels in the shower water, turning the plain shower water into a nourishing liquid for your hair and skin. It won’t Photoshop you or turn you 10 years younger overnight, but most users reported reduced skin itchiness and less hair fall right after the first couple of uses. In any case, it can’t hurt to give it a try. Proper hydration is always a concern for backpackers whose trips involve travelling to places where clean water is not always available. You can’t lug around too much bottled water in your bags. You can drink water from natural sources like a spring or a lake; however, you can never be sure if this type of water doesn’t actually contain some parasite or diarrhea-causing bacteria, which is certainly the last thing you want on a trip. Found yourself in the predicament? A travel filter may help. The Sawyer Squeeze Filter is one of the best companions you can have for a backpacking trip in the woods, the mountains, or in any corner of the world where water quality cannot be taken for granted. This little filter can remove more than 99.99% of all bacteria, protozoa, and cysts such as E. coli, Giardia, Vibrio cholerae, and Salmonella from any fresh water source, as well as other harmful contaminants down to the size of 0.1 micron. At 9.5 x 4 x 3.5 inches, this 3.2 oz filter won’t take more space in your backpack than a book light or an electric toothbrush. And yet it can filter up to 540 gallons of clean water per day, as the design allows very fast processing. That’s enough water for a whole village for a day. Of course, you will have to squeeze it a couple hundred of times for that. Regardless, it’s nice to have the assurance that as long as you encounter a source of freshwater along the way, you can use the filter to produce as much clean, safe water as you need, have the water bottled, and store it for your whole trip. Travelling in a car or a van allows more storage of clean water, but when your trip is long, a better solution is often to carry a filter that’s just large and strong enough to produce drinkable water for you and your companions from a freshwater source on the way. The Travel Berkey is highly recommended in this situation. Similar to its countertop counterpart, the Travel Berkey comes with not only fluoride and arsenic reduction elements, but also the well-known BB9 filter elements that promise to remove various pathogenic bacteria, cysts and parasites, and extract harmful chemicals such as herbicides, pesticides, and volatile organic compounds (VOCs). It has a stainless steel housing with 2 chambers that can hold up to 1.5 gallons of water at once – about the right amount to keep 3 people properly hydrated per day. The various parts have different lifespans, ranging from 1,000 to 6,000 gallons – take note so you can replace them when the time comes. The average family pool uses a large amount of water, and needs a filtration system with a large capacity to handle it, keeping it free from dirt, sediments, and algae. Efficient and simple to operate, the Intex is one of the most beloved filters for residential above-ground pools. This 10-inch filter has a powerful motor that helps generate a pump flow rate of 2,100 gallons per hour. It also comes with a 24-hour timer so your pool can manage itself without much manual involvement. Affordable and easy to control. The filter keeps your pool water clean and free of dirt, algae, and large sediments with a chamber of fine sand. The sand only requires replacement about once every 5 years, possibly making it the most cost-effective pool filter out there. That is pretty much the only maintenance you will have to worry about, as backwashing, rinsing, recirculation, and drainage can all be handled by the machine itself with a simple turn of the control valve. It can provide enough fresh, clean water for a pool of up to 19,600 gallons. Soft water is not always ideal for pools. That said, if you have very hard water, which a majority of the US does, and want to enjoy a swim without having to deal with skin irritation afterwards, or spending time scrubbing the mineral stains off the tiles, softening it may be a good idea. An effective water softener system like the NSF-certified Pelican NaturSoft descaler can be the MVP in this scenario. As a salt-free softener, the NaturSoft converts hard water minerals to a crystallized form, making it hard for them to adhere to surfaces like your skin, your hair, the pipe system, or the pool tiles. It’s actually one of the rare softeners that are certified by the DVGW (Deutscher Verein des Gas und Wasserfaches – German Technical and Scientific Association for Gas and Water) to prevent 99.6% of scale buildup. Despite having a seemingly high initial price, it is in fact budget-friendly in the long term. First, the system comes ready and installation, whether indoor or outdoor, is not any more complicated than a simple water filter. Plus, operation cost is next to zero: unlike salt-based softeners, it uses neither salt nor electricity to work, and there’s no waste water produced. The only thing you will need to mind is the additional pre-filter, which is there to remove any sediment from the water down to the size of 5 microns. This pre-filter only requires replacement every 6 months, or earlier if you’re using it to soften a great amount of pool water. We hope the article was helpful to you in your pursuit of a solution to your water problem. Within the scope of a post, we know we can’t cover all the information you may need; but we will be happy to answer any question you may have about the best water filters. Drop us a line in the comment section – we will get back to you real quick!